Employment underperforming the February Budget forecast; output too. Philadelphia Fed indices say activity is flat. A time series forecast using forward-looking indicators implies a continued rise in the unemployment rate. Ever since the Wisconsin Department of Revenue stopped publishing the Wisconsin Economic Outlook (see here for discussion), I’ve been forced to compile on my own various evaluations of prospects for Wisconsin’s economy. Here’s my take. To begin with, let’s look at the forecasts used in the Governor’s budget, from February (based on IHS MarkIt forecasts), and compare to outcomes realized so far. Figure 1: Wisconsin nonfarm payroll employment (blue), and forecast used in FY2017-19 budget (red), in thousands, both on log scale. Source: BLS and DoA. As noted in this earlier post, employment has been trending sideways for some months. Currently, average employment through September 2017 is nearly 11,000 below the forecast for 2017 (and is still 29,400 below the level promised by Governor Walker for January 2015). Figure 2: Wisconsin GDP (blue), and forecast used in FY2017-19 budget (red), in millions Ch.2009$, both on log scale. NBER defined recession dates shaded gray. Source: BEA, and DoA. So far, GDP has grown 2.1% q/q SAAR in 2017. It would need to grow about 3.2% SAAR for the next 3 quarters to hit the forecasted level. What do the Philadelphia Fed indices indicate for economic activity in the state? That was covered in this post. Here is Figure 1 from that post, repeated. 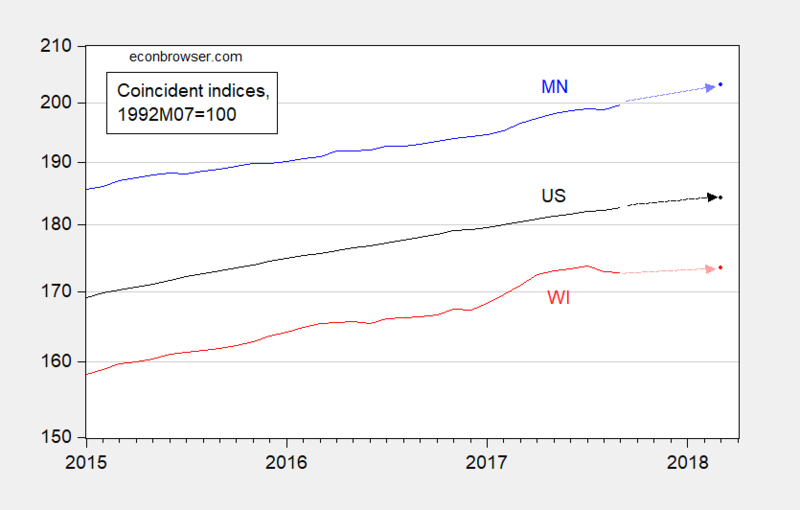 Figure 3: Coincident index for Minnesota (blue), Wisconsin (red), and US (black), 1992M07=100, all on log scale; March 2018 values are implied by leading indices. Source: Philadelphia Fed, author’s calculations. To be blunt, the outlook is flat. Finally, what about the unemployment rate in Wisconsin? It has been rising since June 2017; it is now 0.4 percentage points higher than it was at its trough. 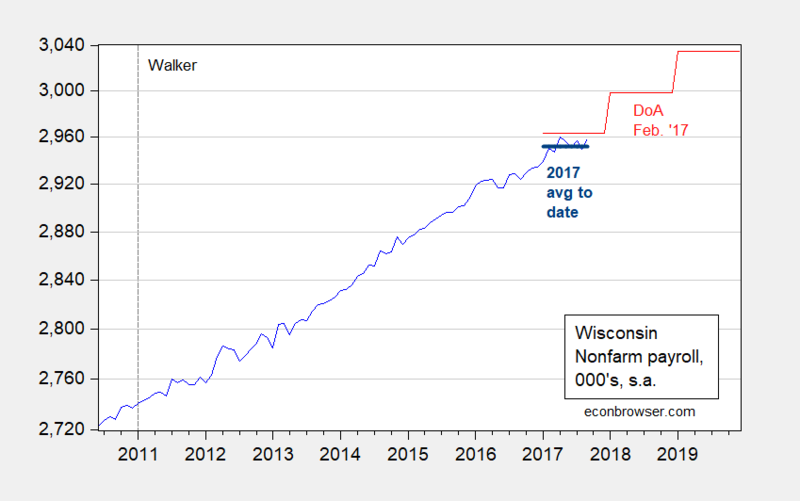 My colleague Bruce Hansen has been producing forecasts for several years; his most recent forecast is for a further increase in the Wisconsin unemployment rate. Figure 4: Wisconsin unemployment rate and forecast. Source: BLS (September 2017 release) and Hansen (2017). While this is not a Kansas-level calamity, it certainly does not look particularly bright. 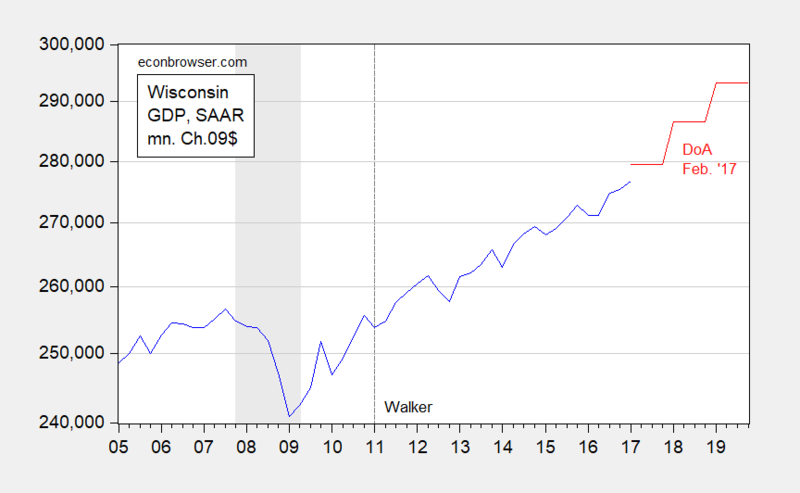 In any event, I’m not sure I agree with Governor Walker that the Wisconsin economy is on fire. This entry was posted on November 11, 2017 by Menzie Chinn.